Scientific study was done by the methodology on runners who have been intensively preparing for the 10 km running race, with recommended intake of 3 doses/daily with an interval of 6 hours. Following charts show that all the parameters have been rising over the time of taking supplement. It could also be noticed that all parameters have decreased the very next day after the race (the 10th day) except of endurance. It's shown as a slight fall or even as a complete stop of growth, which could be explained as consequences of the increased effort during the race. The athletes have also been reporting significant improvement of well-being during the same testing period. It is commonly known that athlete's immune system decline after the intense sport activities. The most critical period of increased risk of upper respiratory tract infection is the first 24 hours after the intense effort. Due to the stimulating effect of many polyphenols in products as rich in polyphenols as Belinal® sport recovery are helpful for the athletes. Our body is constantly producing energy by metabolizing nutrients in a process which involves oxygen consumption. In this process approximately 5 % of the oxygen molecules lose an electron and become free radicals. If they are not immediately inactivated by antioxidants from our body’s internal stores, these free radicals are able to attack virtually all cells in the vicinity. By causing damage to the cells within reach they also produce tissue injuries and harm the entire body. It is believed that muscle stiffness due to the intensive training results from accumulation of free radicals and metabolic wastes in the body. The more intense the training, the more oxygen is taken up by the body. The more oxygen than we inhale, the more free radicals are generated. This leads to muscle pain and inflammation, fatigue, premature cells aging, slower recovery - and what is often disregarded until it is too late - to a weakened immune system and increased susceptibility to infection.. 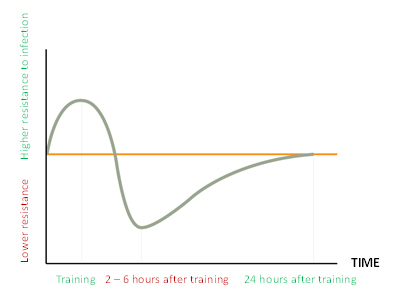 The biggest drop in our defense system occurs 2-6 hours after intense training. When resting phase is followed by training, gradually through slow aerobic to anaerobic, the formation of free radicals increases from 12 up to 20 times. Many endurance athletes place excessive strain on their bodies. As a consequence, they are thereafter forced to rest or to cope with the damage caused by excessive exercise. Most of the pain and damage is a consequence of muscle injuries at the microscopic level. This is a normal and even a desirable process. After such inflammation, the muscle fibers become longer, stronger and better adapted to the great physical effort compared to the period prior exercise. Not every inflammation is beneficial to the muscle since it may also be caused by the free radicals that are released in large quantities during an intensive training. Many free radicals attack lipids in the membranes of muscle cells which can cause cell death. This process, in fact, also leads to inflammation and pain in the muscles. Each intense workout triggers a chain of inflammatory processes which can last up to 20 hours. Due to the muscle pain and fatigue the exercise is often less effective. Therefore, we are in a dilemma whether to overload the muscles and risk the damage caused by free radicals together with long-lasting muscle recovery, or to reconcile ourselves to poor achievements due to the insufficient training. It is necessary to help the body to fight the crowd of free radicals by providing weapons, which unfortunately our body is lacking - these are antioxidants. In such a way we can make progress in sports without the need to suffer pain and injuries. Belinal® sport recovery is a dietary supplement with antioxidant and recovery activity that helps to eliminate excessive amount of free radicals, protects muscles, improve the immune function and physical performance. Vitamin C and Zinc contributes to the normal functioning of the immune system. Vitamins B6, B12 and C contribute to the reduction of tiredness and fatigue. Magnesium contributes to normal muscle function.